UN-Habiat in p artnership with Ministry of Construction-Training School, Thuwanna, Yangon and in collaboration with Myanmar Engineering Society has been promoting safer construction trainings through certification since 2013, with the support of Ministry of Foreign Affairs-Norway, USAID, ECHO and DFID. During 2013, has trained around 155 participants (including 28 women) from Ayeyarwaddy, Rakhine and Thaninthyiri Region with the support from ECHO through Myanmar Consortium For Community Resilience (MCCR).In 2014/2015 in partnership with USAID/OFDA it supported the trainings to align with the National Skills Standards Authority (NSSA) programme and trained 240 participants (including 27 women)from Ayeyarwaddy, Yangon, Mon and Thaninthyri Region and of which 102 participants including 6 women could received NSSA Level I certificate. It is currently targeting another 120 participants in 2015 and 250 participants in 2016 through ECHO funded Myanmar Consortium For Community Resilience (MCCR) and DFID funded BRACED programme. 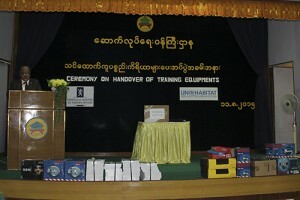 Recognizing the importance of equipping the training center to deliver high quality trainings, UN-Habitat through the support of MFA Norway provided training aids to strengthen and scale up trainings in Carpentry and Masonry to Ministry of Construction-Training School, Thuwanna, Yangon.